What inspired you to write Devil’s Kiss and Dark Goddess? I love history, supernatural horror, religious mythology and fairy tales. This was the best way I could think of combining them all. 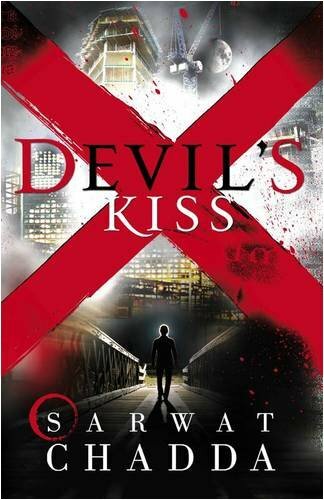 Devil’s Kiss was taken from the Old Testament story about the Biblical plagues. The tenth plague has the angel of death slaying all the firstborn of Egypt. I decided it would be interesting if the same angel decided to do it now on modern Britain. Dark Goddess is based on pagan mythology and the first divine figure prehistoric man worshipped, the Great Goddess. In my version I give her a name, Baba Yaga. She’s a fairy tale witch out of Russian myth but is based on the winter version of the Great Goddess, the Old Crone. Then I discovered that the original Amazons were said to have come from Southern Russia. Since I wanted Dark Goddess to be centred on female mythology, the Amazons were perfect as Baba Yaga’s followers. All I need to do was turn them into werewolves too! How did you come up with the character Billi SanGreal? Since I have daughters it was a given I’d write a heroine. Since I like action, she was going to be a fighter and the stories were going to be big action adventures. There were various clichés I wanted to overturn. The first was the idea of a son following in his father’s footsteps. It’s the 21st Century, why not a daughter? I love the idea Billi is being trained by the Master of the Templars to, one day, be his replacement. The other cliché was Billi’s rejection of the world she’s in. She wants to have a quiet, peaceful life. I love Arthur SanGreal too! What was the inspiration behind his character? Again, being the father of two girls I was interested in exploring this in extreme situations. The big challenge was explaining why a parent would put their child in such deadly situations. Well, Arthur’s not a very good parent and, let’s face it, a ruthless fanatic. It’s only towards the end of Devil’s Kiss do we discover the cost of his decisions, and the sacrifice he was willing to make. That duality is key to what makes Arthur such an interesting character to write, he’s a frightening figure, he has to be since he fights monsters and can only succeed if he is more terrifying than they are. But he’s also a father and loves his daughter very dearly. Duty versus Love was the big theme in Devil’s Kiss. Arthur struggles with it and so does Billi. And both have to pay a terrible price in the end. I love the mythology you’ve created with the series. What made you decide to base it around the Ancient Templar legend? I love the Crusades period and the Templars were central to that. Then they have so many great legends attached to them. Did they possess the Holy Grail (yes they did and you find out what they did with it in Dark Goddess), were they black magicians, did they summon demons, did they make deals with the Assassin cult and how did nine men become the most powerful military organisation in Christendom? So much rich material, just lying there to be used and manipulated! It made my life easier because there was so much there to choose from. As a member of The Order it is Billi’s task to fight the Unholy. I love your take on the supernatural and the way you base it around actual myths and legends. Is the occult a subject that really interests you? I remember reading Greek Myths at a very early age. Then Norse, Celtic, Hindu, Russian and Middle-Eastern. I was brought up a Muslim but my wife’s the daughter of a vicar. I don’t know why but I find it fascinating. Myths and religion have created the human race. Our identities are based on the myths we have about ourselves. In many ways they’re more real that history, or the truth. 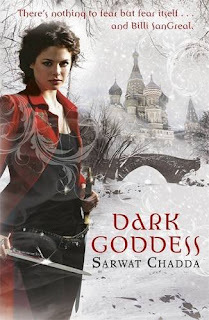 What made you decide to move the story from London to Russia for Dark Goddess? Two things. First I’ve been wanting to write a story about Baba Yaga for almost fifteen years. Russian mythology is so full of cool characters and has a savagery to it that’s been removed from western fairy tales. The other reason was that I wanted to take Billi out of her comfort zone. She knows London. She has the Templars to back her up. How could I raise the stakes in Dark Goddess if she was stomping over the same old territory? Russia has vast wilderness, Moscow is a gigantic city, the most populous in Europe and steeped with religious architecture and Imperial grandeur. I could have written an entire trilogy, just set in Moscow. Do you have a favourite scene in the book? When Billi finally meets Baba Yaga in the cave. Baba Yaga is twenty thousand years old. She’s the first witch and the mid-wife on mankind. She taught him tools, magic, how to build and survive. But if she’d known what he’d become, maybe she would have strangled him in the crib. I wanted the meeting to be almost overpowering with prehistoric ambience. As luck would have it I visited the caves of Lascaux with their prehistoric paintings of horses, long-horned cattle and mammoths. There were caverns with gigantic limestone formations, one called the Medusa, and the walls were covered with crosshatched grooves, where the bears had sharpened their claws. It was then when Baba Yaga came into true focus. Before she’s been vague and shadowy. Now I’d walked in her home I knew so much more about her. If Devil’s Kiss and Dark Goddess were made into a TV series or film who would you like cast in the roles? Easy. Either of my daughters for Billi (though they’re too young right now, Billi is based on a bit from each). Arthur would be James Purefoy. Gwaine is Ray Winstone. Percy would be Idris Elba. Kay I always saw as a young David Bowie (from the Aladdin Sane period). Mike would be Allan Hyde (Godric from True Blood) and Ivan’s based on a younger Christian Bale, it’s all in those razor sharp cheekbones! Are there more books planned (please say yes!) and if so, can you give us any hints for what’s next for Billi SanGreal? I certainly have plans for Billi. The next story will be set in the Middle East. I’ve dropped enough hints regarding Jerusalem so that’s where I’d like to take her. It’s the Templars’ spiritual home. I’d also like to explore some loose ends regarding Billi’s mother, Jamila. But alas, none of this is definite! Book 3 depends on how well the first two do. And that’s totally down to you guys. Who are some of your favourite authors? Are there any books you would recommend? 1. Phillip Pullman. Read the Northern Lights series. Like, d’uh. 2. Philip Reeve. His Mortal Engines series is beyond awesome. I want to be Philip Reeve when I grow up. 3. Clive Cussler and Bernard Cornwell have been major influences. Cussler because he weaves history, myth and worldwide action seamlessly. You could do a lot worse than pick up his Dirk Pitt books for pure adventure. Cornwell because he knows how to write heroes and battle scenes, plus makes real history work for him in his fiction. I’ve made a very small homage to Cornwell’s hero, Richard Sharpe, in Devil’s Kiss as a gesture of my thanks. Did any of these inspire you to become a writer yourself? Phillip Pullman. When Harry Potter first became big, I thought it was all rather sad that grown-ups were reading kids books. But a friend lent me Northern Lights and I left it on the shelf for months. Finally I picked it up and was hooked. If this was what was being written for children nowadays, I wanted to be part of it. I was desperate to be part of it. You can check out the authors website here and my reviews for Devil's Kiss and Dark Goddess. I really am going to have to get myself copies of this series. Great interview! Fab questions Sammee, and such a fascinating interview. Great interview! I also love the scene where Billi meets Baba Yaga in the cave. Good pick, Sarwat!